Extending your physical reach on the job site can increase productivity and reduce the risk of injury – All with simple extended reach equipment brought to you by the industry’s top manufacturers. Not only can the Graco S04350 Pole Gun provide access to hard to reach areas, but it also reduces the amount of reaching and exertion during the application process – reducing user fatigue and minimizing injuries. Work smarter with the Graco Pole Gun. The S04350 includes a ½ inch high pressure, stainless steel ball valve to provide you with better control during spraying. The wand itself is 36 inches in length and is designed with an angle towards the spray tip – Which allows the application process to provide an even and consistent coating every time. The grip handle is a T shape, which settles the weight of the gun in a comfortable design, preventing strain or injury to your spraying hand and arm. A pole gun is beneficial in many different applications – Spraying hard to reach areas like vaulted ceilings, stairways, etc. – and also for coatings applications that would typically require bending for long periods of time – causing back pain and potentially other discomforts. Use the pole gun as an alternative – and simply add it on to your current spray set up. Save yourself and your crews from hours of bending over during spraying, - or alternatively, from having to use a ladder or scaffolding to get a job done right. Shop Cleasby’s equipment line up, as well as browse the full Graco catalog, all from the comfort of your home or office. 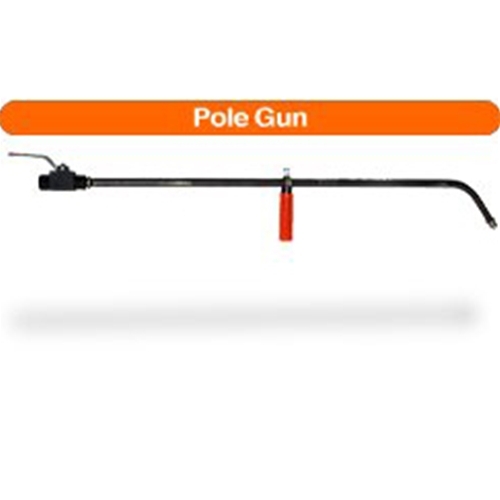 Allow our experts to assist you in ensuring that your pole gun with be compatible with your current equipment, and that it is a great fit for your typical applications. Take the pain out of spraying with a simple extension that provides you the ability to spray in a more natural stance – reducing strain and improving productivity.